After the destruction of Xandar by the forces of Annihilus during the Annihilation war, the WorldMind and the entire Nova Force were downloaded into the body of Nova 11249-44396 (Richard Rider of Earth). Following the victory over Annihilus, Richard Rider (aka Nova Prime) began his mission of bringing peace and justice to the Andromeda Galaxy. Soon after beginning his mission, Nova Prime was attacked by Kree Sentries controlled by the Phalanx. In his attempt to escape the Phalanx's energy sphere which contained the Kree Empire, Rider was severely injured. To insure that his body was protected while healing, Nova Prime transferred a sliver of the Nova Force to a Kree medic named Ko-Rel who became Nova 0001. Ko-Rel was killed by a Phalanx-controlled Gamora and her sliver of the Nova Force was returned to Rider. Unfortunately, the strain of helping Richard Rider control the entire Nova Force and maintain his sanity caused the WorldMind itself to lose its own hold on reality. Some time later, during a Skrull attack of Project: Pegasus, a group of five Nova Centurions appeared on Earth to assist Richard Rider in fighting off the alien invaders. These Centurions were deputized by the WorldMind without the knowledge of Richard Rider. While residing in the gestalt mainframe at Project: Pegasus, the WorldMind continued to create more Nova Centurions. This included a number of Pegasus personnel along with Richard Rider's brother Robert. 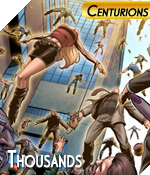 Later, the WorldMind increased the number of Centurions into the thousands. In order to control the Corps, the WorldMind used subliminal mind control and endorphins on the Centurions. Due to his time inside Richard Rider's body and mind, the artificial sentience had a complete understanding of the human body and how to control it. This knowledge led the WorldMind to its decision to use Earth humans for the vast majority of its recruits. The WorldMind went even further and downloaded his sentience into the organic planetary being known as Ego - The Living Planet. Ego's higher functions were suppressed by the WorldMind and the artificial intelligence took over the lifeform. Its organic structure was been reorganized into the WorldMind's new base of operations named Nu-Xandar. 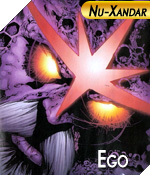 During the Shi'Ar/Kree War (aka War of Kings), Richard Rider was able to purge the corrupting influence of Ego from the WorldMind. As a result, the personality of Ko-Rel was selected as the new interface for the WorldMind. 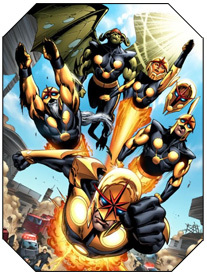 Following the war, the Nova Corps was reduced in number and the remaining members are currently on a probationary status until they can be fully trained. Following the war, the new Nova Corps and Nova discovered a long lost Xandarian starship, the Resolute Duty, along with a Centurion named Zan Philo. The WorldMind was downloaded itself into the ship's computer system and operated the ship. Philo took on the responsibility of training the Probationers. During the Thanos Imperative and the battle with the Cancerverse, the entire Nova Corps was rendered powerless by Centurion Nova Prime Richard Rider. Rider needed the power in order to fight in the final battle with the Cancerverse's army and Thanos. He, along with Peter Quill, was able to contain Thanos long enough for Death to consume the Cancerverse and collapse the Fault. As a result, Richard Rider and Quill were lost to the universe. Richard Rider: Operative 11249-44396: Originally from the planet Earth who inherited powers and rank of Centurion Nova Prime from Rhomann Dey. Current status - Active. Ko-Rel: Operative 001 - Centurion - Kree medic who served on the light cruiser Spirit of Supremor. Mother to a son named Zan. Current status - Deceased (killed by Phalanx-infected Gamora on the planetoid Nil-Rast). Ego - The Living Planet: Centurion - Orginally from the Black Galaxy. A sentient planet. Current status - Traveling the universe after no longer being controlled by the WorldMind and being used as Nu-Xandar. 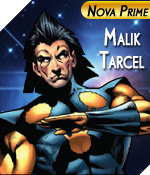 Malik Tracel: Nova Prime - Originally from the Shi'Ar Empire. Current status - Unknown. 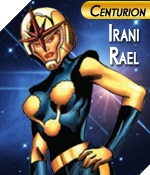 Irani Rael: Centurion/Probationer - Originally from the planet Rigel. Current status - Inactive. 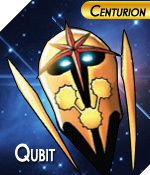 Qubit: Centurion/Probationer - Synthorganic being from the species called the Manufactured Harmonites. Current status - Inactive. 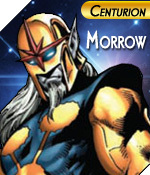 Morrow: Centurion/Probationer - A member of the Mephistoid species of the planet Try'lsart. Current status - Inactive. 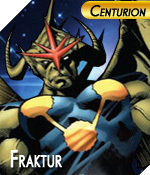 Fraktur: Centurion/Probationer - Originally from the planet Kakaranthara. Distant cousin of Fin Fang Foom. Current status - Inactive. 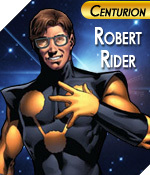 Robert Rider: Centurion/Probationer - Originally from the planet Earth. Scientist at Project: Pegasus. Brother of Richard Rider. Current status - Inactive. 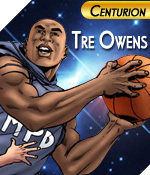 Tre Owens: Centurion/Probationer - Originally a Washington, DC police officer from the planet Earth. Currently Inactive. 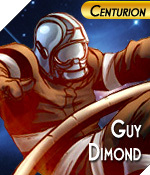 Guy Dimond: Centurion - Originally a French firefighter from the planet Earth. Currently inactive. 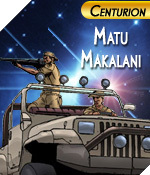 Matu Makalani: Centurion - Originally a game warden in the Taita District of Kenya from the planet Earth. Deceased. 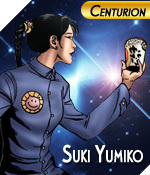 Suki Yumiko: Centurion - Originally a grocery clerk in Tokyo, Japan from the planet Earth. Deceased. Lindy Nolan: Centurion/Probationer - Originally a lifeguard in Syndey, Australia from the planet Earth. Currently inactive. 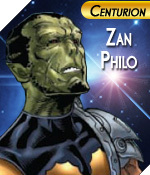 Zan Philo: Centurion/Trainer - Race unknown. Current status - Inactive.